It all started in the early fall of 1977 when I was almost three. 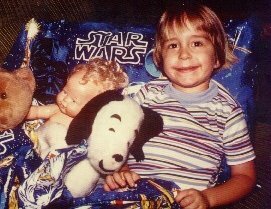 One of my first memories was going to see "Star Wars" with my family a few months after it was released. You see, I grew up in Greenville, NC, a college town of about 30,000 at the time. And since "Star Wars" initially premiered on only 32 screens in May of '77, I am sure our local theatre did not get the film until months afterwards. That, however, was not the case in '80 and '83. After that first screening, my dad tells me how I immediately asked him, "When can we go back to see it again?" Well, it's safe to say we went back and saw it multiple times. Let me share with you some evidence on that matter. I remember watching the Star Wars Holiday Special on TV at my grandmother's house during Thanksgiving of '78. It was so weird seeing Star Wars on the television. Although I did not remember the details of that show, years later I was frightfully reminded by a friend who owned a copy in his video collection. Man, it sucked--bigtime! But the Boba Fett cartoon was pretty cool. OK, let's play "Where's Waldo?" with toys instead. Can you find the Remote Controlled R2-D2, Death Star Playset, TIE Fighter, Colonial Viper, and Godzilla? My brother Cory and I wear the stylish Star Wars shorts. Also, I am carrying my trusty Star Wars lunchbox and action figure case, complete with figures for playtime! 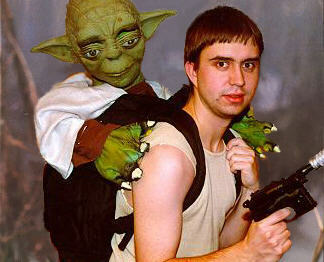 That's me exploring the Dark Side of the Force as Darth Vader and my brother on a mission to find his home as E.T. for Halloween, 1982. 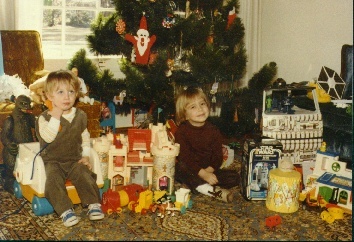 Christmas 1980. Santa Claus, a.k.a. dad, gave me quite a decision that year. I was into Legos as well as Star Wars. He told me that I could only get one big-priced toy. I chose a huge Lego city playset over the enormous Kenner AT-AT Walker. However, on Christmas morning, the Lego set was not the only large item sitting under the tree. Santa spoiled me with a pre-assembled AT-AT as well! Here, my brother and I prepare for our ground assault. OK, where is that Kenner insert sheet now?! The funny thing about this picture is that I am actually assembling my next door neighbor's toy during his birthday party. Seems he wanted someone with experience putting this one together. Does anyone speak Bocce? Too much play. Must take rest. Figures stay with me! Darth Vader's TIE Fighter, Landspeeder, and the glorious 12" Boba Fett! Boy, I had it all! OK, I know everybody has their "if I only bought that" story. Well, here's mine. 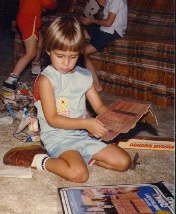 I was very fortunate to have a father who oftentimes spoiled me with my toy requests. But there was one day when I blew it. I take full responsibility for the tragedy. I played with all of the die-cast vehicles except one. One day at the local mall we saw a dozen of these peculiar white double barrelled bent winged TIE fighters. The store was called Circus World. They were later bought out by Kay-Bee. Anyway, my dad asked me if I wanted one. For some unknown reason my collecting "must have it all" instincts failed me that day. I shrugged it off and said "No, I don't really need that one. It was only in the movie for a few seconds." Flash forward 10 years. It's worth how much!?! That friggin' TIE Bomber! My dad has been highly instrumental in assisting me with collecting. In fact, it was his keen eye towards the future which started my "rebirth" into the world of Star Wars collecting. Back when the movies were released, my father purchased several different Kenner items in duplicate. I would rip open one box and he would put the other one hidden away. Now this only happened every once in a while. But one day in the late '80s I found this box of new, sealed Kenner toys up in the attic. I found a Landspeeder, TIE Fighter, Sears Cantina Andventure Set, several 20 back figures, a die-cast Imperial Cruiser and a 12" Stormtrooper. After finding this stash, my passion began to collect everything all over again--this time keeping it all in new, unopened condition. Around that time I found a very early unauthorized price guide to Star Trek and Star Wars items. This introduced me to the whole idea of the collectors market. Then I found out about Toy Shop. Several years later I got hooked on the net. We all know what that's like. Prior to moving out west for USC film school, I decided to get a personalized plate. One of the most unbelievable experiences in my lifetime--the night I introduced myself to George Lucas!! Christmas week: 1997. I drove up to New York City with my dad for a quick weekend trip with the number one purpose being to attend a Broadway performance of "The Diary of Anne Frank" starring Natalie Portman. Anyway, just before the intermission is over I notice that sitting about 15 seats away from me appears to be George Lucas. So, while I was very much enjoying Natalie's impressive performance during the second half, I was also mentally preparing myself for what I had to do. Once the play ended, I went over to him and introduced myself. I said a few words and asked him to sign my ticket stub. He was alone with his eldest daughter. No one else even noticed who he was. Unforgettable! I have had a very wonderful 24 years in this world. 21 of those years have been blessed with a symbiosis to the creation of George. All those hours playing, collecting, hunting, conversing (add more verbs please) Star Wars has been great fun! Meeting new people who have these similar pleasures is a special joy. Sharing stories, memories, ideas, and goals is what it's all about. Now with three new movies ahead of us, I'm ready to do it all over again--although my wallet isn't quite ready. One final comment: no matter how much merchandise floods us in the next ten years, remember that it's the movies which really count. Sitting in a jam-packed theatre with other cheering fans and watching the magic of Star Wars unfold on the big screen is one of life's real gifts.